Tolerance REPOST ISN’T ALLOWED. Model: #sunnyarditya / @sunnyday.studio #futarinokizuna #sun_pro #イラス If you dislike depressive arts, block this account. Badmouth REPOST ISN’T ALLOWED. Model: #anggrekriani / #cendrawasihagency #futarinokizuna #sun_pro #イラス If you dislike depressive arts, block this account. Note: so I only read through comment section recently and some ppl told me about repost stuffs etc. To be honest, I am kind in rough situation right now,I can’t care much about them. Thanks for telling me, but if they are shameless then so be it. Let them take the responsibility. This is internet, after all. Those who approached me via email for permission are respectable people. Burden REPOST ISN’T ALLOWED. Model: #sunnyarditya / @sunnyday.studio #futarinokizuna #sun_pro #イラス If you dislike depressive arts, block this account. Treat or Trick REPOST ISN’T ALLOWED. Concept: SONNE / @sunnyday.studio #futarinokizuna #sun_pro #instaart #イラス If you dislike depressive arts, block this account. Self Doubt REPOST ISN’T ALLOWED. Model: #renanatalia / @sunnyday.studio #futarinokizuna #sun_pro #instaart #イラスト#digitalartist If you dislike depressive arts, block this account. Mob REPOST ISN’T ALLOWED. Concept: SONNE / @sunnyday.studio #futarinokizuna #sun_pro #instaart #instadraw If you dislike depressive arts, block this account immediately. Birthday REPOST ISN’T ALLOWED. Model: #sunnyarditya / @sunnyday.studio #futarinokizuna #sun_pro #instaart If you dislike depressive arts, block this account immediately. Note: once again, thanks for the massive birthday greetings yesterday. I’d like to say “happy birthday” to you too, no matter when it is, simply because thank you for loving my arts,whether it’s SUNPro or not. X REPOST ISN’T ALLOWED. 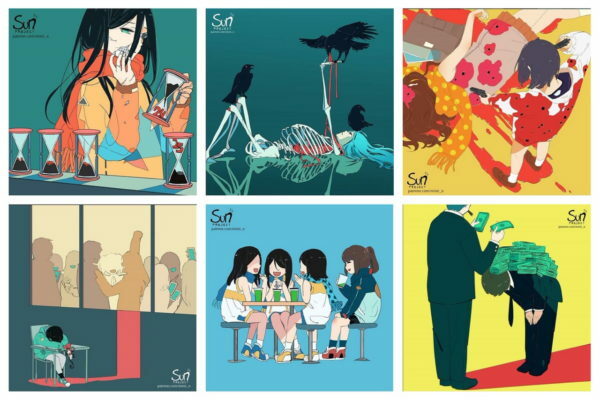 Concept: SONNE / @sunnyday.studio #futarinokizuna #sun_pro If you dislike suicidal arts, block this account immediately. Hollow REPOST ISN’T ALLOWED. Model: #sunnyarditya / @sunnyday.studio #futarinokizuna #sun_pro If you dislike suicidal arts, block this account immediately. Thank you very much for your support towards my non-SUNPro arts. I truly appreciate and need it. Wish REPOST ISN’T ALLOWED. Model: #renanatalia / @sunnyday.studio #futarinokizuna #sun_pro #animestyle #instadrawing #instaart #artwork If you dislike suicidal arts, block this account immediately. Secret REPOST ISN’T ALLOWED. Concept: SONNE / @sunnyday.studio #futarinokizuna #sun_pro #digiart #instadraw #instaart #artwork If you dislike depressive arts, block this account i mmediately. Pretend REPOST ISN’T ALLOWED. Model: #sunnyarditya / @sunnyday.studio #futarinokizuna #sun_pro #digiart #instadraw #instaart #artwork If you dislike suicidal arts, block this account i mmediately. Divorce REPOST ISN’T ALLOWED. Concept: SONNE / @sunnyday.studio #futarinokizuna #sun_pro #digiart #instadraw #instaart #artwork If you dislike depressive arts, block this account immediately. Moving On REPOST ISN’T ALLOWED. Model: #sunnyarditya #renanatalia #rendiutomo / @sunnyday.studio #futarinokizuna #sun_pro #digiart #instadraw #instaart #artwork If you dislike suicidal arts, block this account immediately. #inktober comic is taking a break today. Encouragement REPOST ISN’T ALLOWED. Concept: SONNE / @sunnyday.studio #futarinokizuna #sun_pro #digiart #instadraw #instaart #artwork #inktober comic is taking a break today. If you dislike suicidal arts, block this account immediately. Influence REPOST ISN’T ALLOWED. Model: #anggrekriani – #mikeperdana – #vonnysetiawan / #cendrawasihagency Concept: Rendi Utomo / @sunnyday.studio #futarinokizuna #sun_pro #digiart #instadraw #instaart #artwork If you dislike suicidal arts, block this account immediately. Thank you for all your love so far!